When I search for information and don’t find anything I very often remember at least three statements from authors, and journalists alike, telling me that the internet is the perfect example of information overkill: the more is available and the more you can search the less you actually find. While this certainly is true it’s also very vague because, in many ways, there always was overkill. Think of the legendary library of Alexandria. I am sure they had the same problems. A much more precise representation of this problem is a model used in knowledge management. 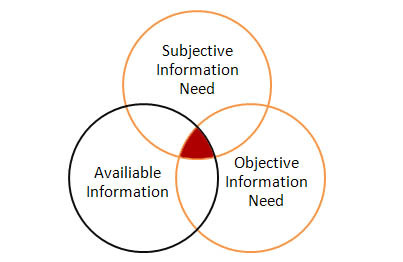 This model distinguishes between three overlapping information areas. The first area is your information need – or better: your subjective information need. This is what you think you need. The second area is the objective information need. This is what you really need, or better: what is needed objectively. This is especially important when you are searching information for someone else. As you can see, the tiny little red spot in the middle, in which all three circles overlap, is the final result you get. The way you search or other factors decide about the ratio of overlapping. Sometimes you can get the close to complete overlapping; sometimes they are even less overlapped than above. In any way, a fracture of everything is the best you can get. Okay, so why do I write about all that stuff in this movie blog? Sometimes it is simply called “Turkish Star Wars”. And when you know that (available information), a whole new world opens up before your eyes.